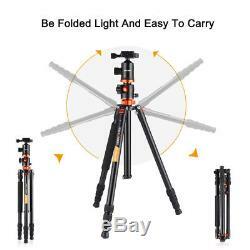 K&F Concept Portable Tripod Camera Magnesium Aluminum Alloy Tripod Monopod with Transverse Center Column, 360 Degree Ball Head, 4 Sections, 22.04lbs Load Capacity with Carrying Case for Canon Nikon Sony Olympus Camera DV Black 72 TM2534T. 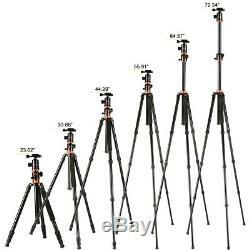 2-in-1 tripod:one leg can be used as monopod, 14.76 inches minimum length, 72.24 inches operating height, compact and portable; Pull-out button angling adjustment, ensuring single adjust of each leg. 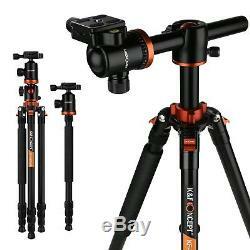 4-section central column and two section central axes down enable you to shoot close to ground images. 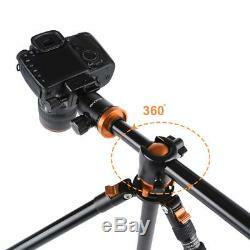 360 degree horizontal scale on base, we can do panoramic shooting via 360 degrees. 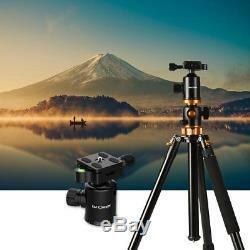 The Multi-Angle Center Column can be adjusted from zero to 180 degrees for maximum flexibility, whether your using it for macro close ups or broad panoramic landscapes. 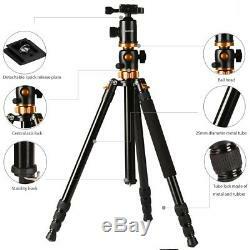 Magnesium aluminum alloy tube, three positions can be adjusted. It has the rigidity intensity, high-efficiency shock absorption, better heat resistance and corrosion resistance. It is fit for any digital camera with 1/4 screw; Provided with a portable free pocket, easy to carry, making outdoor photography more convenient. Specification Brand:K&F Concept KF-TM2534T Color: Black Material: Magnesium Aluminum Alloy Net Weight: 4.4lbs(Head Included) Sections: 4 Head Type: Ball Head Panning Range: 360 degree Applicable Brand: Nikon/Sony/Pentax/Canon Applicable Model: All Max Tube Diameter: 1" Max Height: 72" Folded Height: 18.5" Min Height: 14.76" Load Capacity: 22.04lbs. 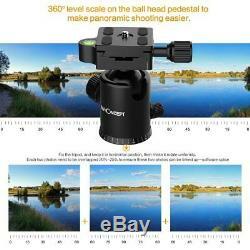 Features Ball head can be rotated 360 degrees, helping to expand camera activity range when panoramic shooting. 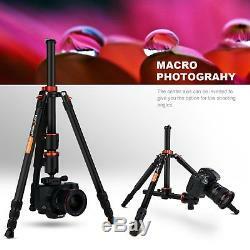 Central column inverted installation to realize the lowest angling shooting, macro shooting, and special photography. 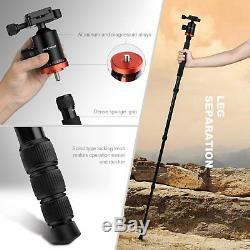 Central column can be rotated 360 degree horizontally, making it easier for photography enthusiasts to realize panorama shooting. 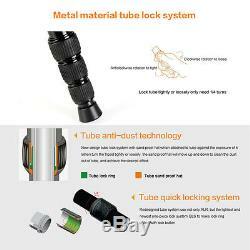 Tube made of high quality magnesium aluminum alloy, 1 tube diameter, can be 180 degree reflexed, better portability. Spiral type locking knob makes operation easier and quicker, better locking strength; Leg with foam sheathing can be individually unscrewed to be converted to a monopod or cane. 3/8 standard threaded connection, can be attached to all kinds of photography; 180 degree reflexed function, reduce storage space and improve portability. Model:KF09.007 Material: Magnesium Aluminum Alloy. Height: 16"-62" Weight: 2.5lbs (head included) Maximum Load: 22.04lbs Sections: 4. Model:KF09.008 Material: Magnesium Aluminum Alloy. 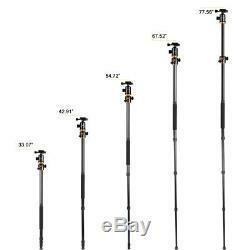 Height: 15"-60" Weight: 3.34lbs (head included) Maximum Load: 22.04lbs. Model:KF09.009 Material: Magnesium Aluminum Alloy. Weight: 3.73lbs (head included) Maximum Load: 22.04lbs. Model:KF09.010 Material: Carbon Fiber. Weight: 3.32lbs (head included) Maximum Load: 22.04lbs. KF09.031 Material: Aluminum Alloy. 16.5"-64" Weight: 4.3lbs. 13"-50" Weight: 2.69lbs (head included). 19"-67" Weight: 4.4lbs (head included). 17"-65" Weight: 4lbs (head included). 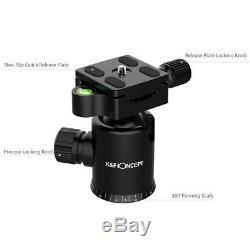 The item "K&F Concept Professional Camera Tripod Monopod Ball Head Heavy Duty for DSLR" is in sale since Wednesday, November 1, 2017.